What is the key issue of introducing PV generation? How to neutralize VREs from renewable sources (VREs)? Experts believe that addressing the problems of widespread implementation of solar energy lies in related industries. 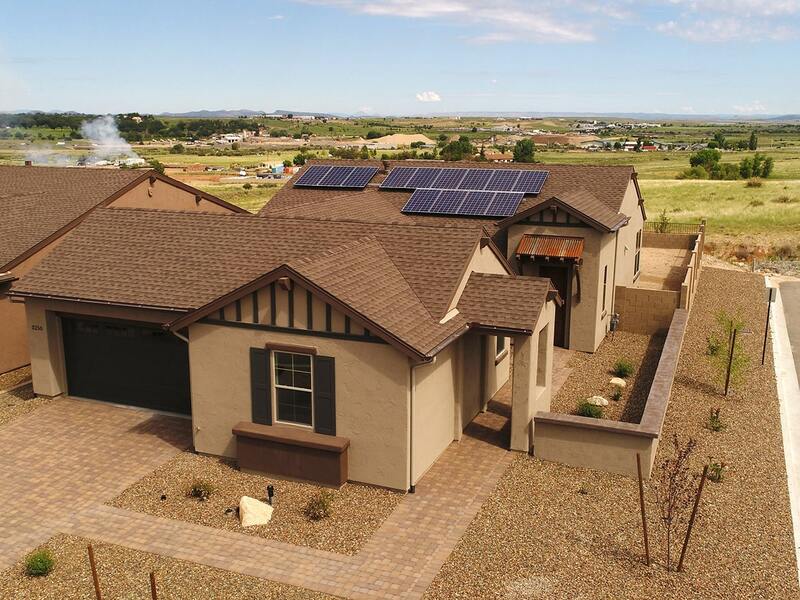 In the photo: The Jasper Solar Society in Prescott Valley, Arizona, USA, unites 2,900 private homes, organized into a virtual PV-power plant with 11.6 MW with a distributed 23 MWh power storage system. In IRENA agency’s report, Electricity Storage and Returnables: Costs & Markets to 2030, concerning the state of the market and the cost projection of energy storage systems with RES, Adnan Z. Amin, the head, categorically argues that, in order to accelerate the deployment of RES, the focus should now be on power storage systems (ESS), including battery systems. Energy savings – from batteries for home PV installations and electric vehicles, along with powerful stationary stations – will play a key role in accelerating the transition to a sustainable renewable energy model. And for these statements there are well-founded reasons based on scientific research and expert judgment. But accelerating the deployment of ESS systems requires immediate action. The power system always needed compensatory capacities that would block peak loads from changes in demand. The introduction of VRE accentuated the need for additional high-speed compensation capacities that should not only absorb fluctuations in current demand, but also eliminate the temporary daily, seasonal and annual instability of VRE generation. This is especially true of the most rapidly deployed RES-solar PV stations and wind-driven installations of different bases. But ESS systems can and should carry out additional functions that are designed to stabilize the power grid, improve energy supply, maintain voltage and frequency, balance, prevent the consequences of accidents on the grid, and quickly redistribute energy flows for the population and industry; Fig. 1 (red shows the functions that directly affect the VRE generation). It should be noted that among the functions inherent in the ESS there is also financial – primarily arbitration, optimization of own self-consumption and supply of “green energy” from PV sources to the general network, managing accounts in order to reduce the maximum cost of purchasing energy from the outside. Optimizing daily consumption through ESS can unlock the consumer’s access to several sources of energy. An IRENA agency in a recent study for the G20 countries found that by 2050 more than 80% of the world’s electricity could be obtained from REE. Solar photovoltaic energy (PV) and wind energy will account for 52% of total electricity production. Electricity storage will be a key element of the energy transit, providing services throughout the supply chain to the electricity grid and end-use sectors. Using of ESS-capacities can significantly reduce existing and growing constraints on the grid and may delay or eliminate the need for large investments in the development of network infrastructure, regardless of whether these restrictions are due to an increase in the share of VRE generation or demand changes. When the great part of the generation of energy from wind and sun expected after 2030 (for example, sometimes up to 70-80%), in the long-term perspective, the need to store energy for leveling fluctuations in extraction and energy consumption in a few days, weeks or months. In addition to the high flexibility of the system, it will require low cost storage technologies and the ability to save electricity over a longer period of time to balance seasonal and annual fluctuations. Fig. 1. Functional capabilities of power saving systems (ESS) and their services by groups of aspects. 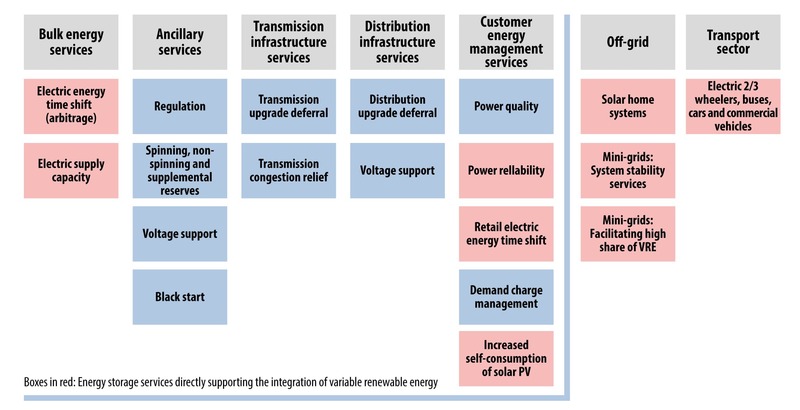 Source: IRENA "Electricity storage and renewable energy: Costs & Markets to 2030". The traditional grid system was used for energy storage and saving systems, mainly using the potential energy of water (hydroelectric storage stations, GAES). Actually even now GESES dominate among all types of ESS, by the middle of 2017 96% of the total installed capacity of all energy storage facilities, see. Fig. 2. At present, the ESAs accumulate approximately 169 GW of installed capacity from almost 176 GW as a whole, of which thermal storage facilities have a capacity of 3.3 GW (1.9%), electrochemical batteries – 1.9 GW (1.1%), and Electromechanical systems – 1.1 GW (0.9%). Thermal ESRs for VREs are used to a greater extent in solar energy systems (CSPs), and among them the most commonly used is the heat accumulation in saline melts (70%). Among electrochemicals ESS undeniably follows lithium-ion technologies (59%). Electromechanical technologies are mainly distributed in the proportion of 40/60 in favor of super-flywheels, but compressed air energy accumulation technologies have a greater potential for development (mainly due to the ability to scale and create storage with a large accumulation capacity, for example, in underground cavities, formed after the extraction of minerals, etc.). But for the moment, ESS type, which accelerates the development in the fastest way, is electric storage batteries of different levels of power and purpose. This is especially true for lithium-ion batteries, Fig. 2. It is predicted that stationary cordless ESS (i.e., without ESS for electric transport) will evolve from 2 GW (2017) to at least 235 GW in 2030. This will happen not only by reducing the set costs, increasing the durability of the operation, the guaranteed number of charge cycles / discharge and improved storage capacity, but also through the new services and capabilities that electrochemical ESS can offer for the sustainability of new energy. Fig. 2. The current distribution of ESS by the most commonly used types by mid-2017 and the distribution of installed capacity among thermal, electrochemical and electromechanical systems for energy storage. Source: IRENA "Electricity storage and renewable energy: Costs & Markets to 2030". 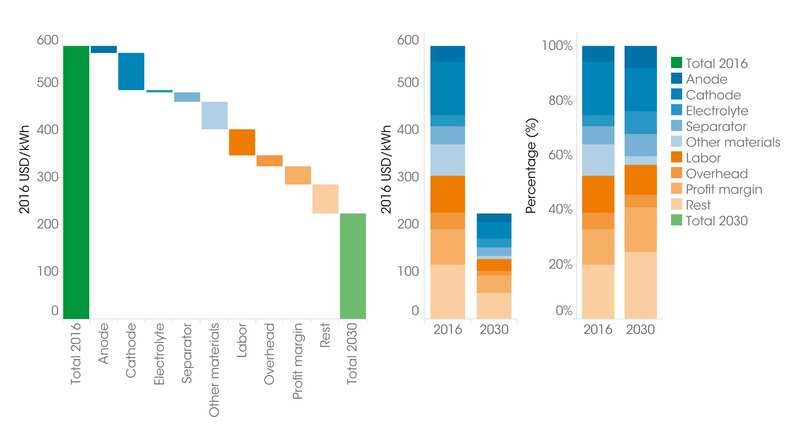 If countries continue to move to doubling the share of RES generation (REmap Doubling scenario), the total ESS capacity of all types by 2030 should triple. This script opens up a new powerful market. By 2030, the capacity of stationary and mobile cordless ESSs from about 4.67 TWh in 2017 will reach 11.89-15.72 TWh (that is, 155-227% higher than in 2017, “low “(Less optimistic) and” high “(more optimistic) projections for implementation of RES). 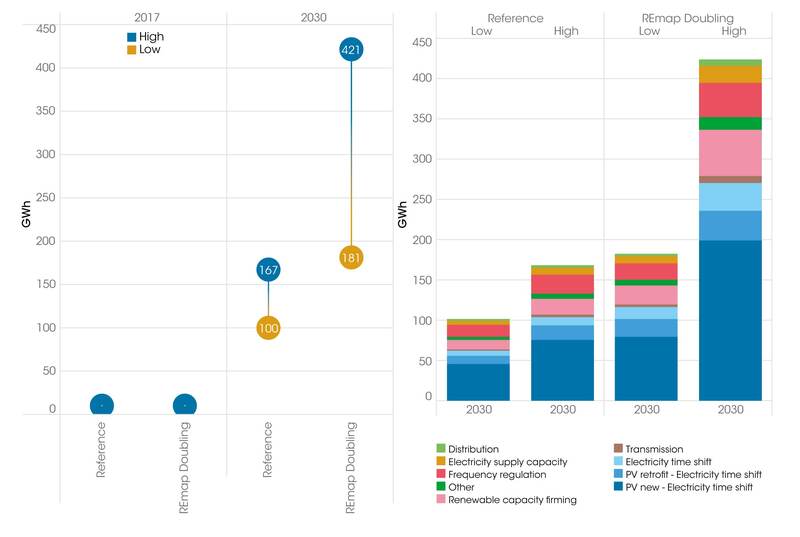 By 2030, the power of GES will increase by 1560-2340 GWh, but the level of their application will decrease to 45-51% primarily due to the deployment of electrical storage systems (REmap Doubling scenario). It is expected that non-hydraulic ESS will increase from 162 GWh in 2017 to 5821-8426 GWh in 2030, ie 20-50 times. IRENA predicts that the need for storage of electricity will only increase, including due to electric transport, which will also require additional flexibility from the grid. Fig. 3. Growth of the global accumulative capacity of stationary battery ESS (BES) by types of their appointment, 2017-2030. Source: IRENA "Electricity storage and renewable energy: Costs & Markets to 2030". Small and medium BES – an increase by an order of magnitude. 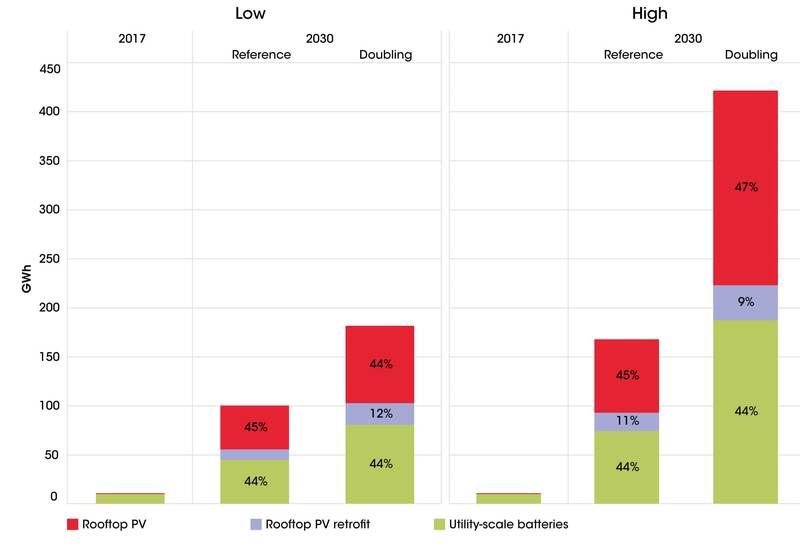 The largest market for BES up to 2030 will be the combination of BES stationary systems with new small solar PV installations for the utility sector, for home PV stations and small distributed networks, see below. Fig. 4. The economic component of such BES can be significantly improved in the next few years, especially in those countries where there is a big difference between residential and commercial electricity tariffs and where revenues for RES in the grid are introduced (green tariff). The small and medium BES market will increase significantly from about 10 GWh in mid 2017 to 45-74 GWh in the main scenario and to 81-187 GWh in the case of REmap Doubling. It is expected that the number of countries where the market will be reformed to expand the VRE generation will increase, new markets for auxiliary services will emerge, including day-to-day balancing services, frequency and voltage stabilization, price arbitrage (including “blockade” technologies ) and so on. Fig. 4. Growth of stationary BES in the small and medium segment, 2017-2030 Source: IRENA «Electricity storage and renewable energy: Costs & Markets to 2030». The IRENA studies on cost reduction and price structure changes in lithium-ion ESS (see Figure 5) shows that the cost of their own batteries will decrease almost threefold from 2016 to 2030. Fig. 5. Decrease in cost of lithium ion batteries, 2016 and 2030 Source: IRENA «Electricity storage and renewable energy: Costs & Markets to 2030». However, this is not the only factor of reducing the cost of BES. 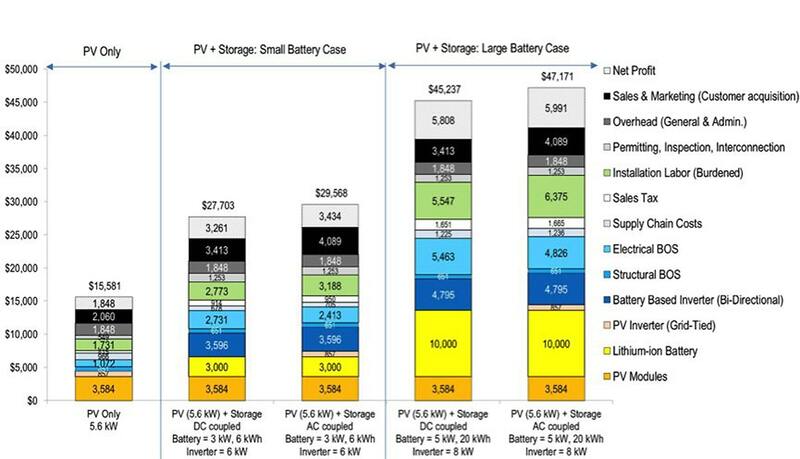 Experts from RMI (Rocky Mountain Institute) and the National Renewable Energy Laboratory (NREL), USA, studying how sunny on-grid battery systems will compete with traditional power supplies, found value components in the US when using PV installations of varying power for housing with BES and without it, see Fig. 6. The difference between DC and AC systems determines whether the battery stores energy directly from the PV panels, or the voltage is initially converted into an AC power source. Systems with DC components are more effective where PV-energy is mostly used at generation time, and AC systems are generally more effective when there is a need to store PV energy and use it at other times or to sell into the network. “Small” systems (3 kW / 6 kWh) mainly cover the primary needs for electricity provision of housing. Lower power (5 kW / 20 kWh) can provide typical daily electricity needs for a 4-person family and an additional four-time power backup than a low-power system. By RMI and NREL methodology, all cost components at the end of 2016 were accounted for project design and components for residential PV systems, and the total cost of purchasing such systems was simulated, with the exception of the federal investment tax credit (TIC). Despite the fact that the capacity of BES in the “big” system is three times higher, and the time of reservation is fourfold, the total cost in both cases (AC- and DC-execution) is approximately 60% higher than the “small” one. A detailed cost calculation shows that hardware costs account only 50% of the total cost of the “small” system and about 60% of the cost of installing a larger battery. And the rest is connected with a large number of non-technical costs: permissions, network connection, costs for fire prevention and insurance, profitable margins, etc. Bureaucratic encumbrances affect not only the costs of a project, but also the timing of its implementation. Modified total set value and cost of components for PV housing systems for small and large battery storage (2016, USD). Source: RMI, "The Economics of Load Defection." So, although the use of BES and other ESS types is currently considered to be the main key factor in implementing RES, a very significant and costly barrier to this one is the “soft” costs associated with permitting and regulatory barriers, tariff and tax policies . In addition to a constant reduction in the cost of technical components, there is a huge reserve for reducing the total cost of installations with storage systems due to administrative, tax and other market characteristics that prevent the acceleration of the deployment of PV-systems with batteries and inhibit energy transit.